Gal Gadot is the perfect embodiment of DC's foremost female superhero in Patty Jenkins' brilliantly executed comic book spectacle. At a time when men in certain circles feel compelled and emboldened to weaponise their fragility in the face of advancing feminism, the world needs a hero like Wonder Woman more than ever. Created more than 75 years ago, and one of DC’s “big three’ characters, Princess Diana of Themyscira has bafflingly always been deemed too risky a property to headline her own feature film. Women behind the camera are equally unsettling for studios, so kudos must be given to Warner Brothers and DC for doubling down on the property, not only giving Diana her own summer tentpole release, but handing the reins to director Patty Jenkins. Even Marvel have shied away from female-focused entries in their cinematic canon, but if the Justice League is ever going to pay off, there’s no getting out of a Wonder Woman stand-alone. So it is with no small amount of relief - surprise even, considering the mess this franchise is already in - to discover that Wonder Woman is great. Epic in scale and thrilling in execution, Jenkins has finally scored an indisputable hit for the DCEU, delivering a fantastical odyssey of wartime escapism that also serves as a gorgeously realised origin story for the world’s foremost female superhero. Israeli bombshell Gal Gadot is fantastic in the title role, imbuing Princess Diana with the perfect blend of naivety, compassion and determination. Wholly convincing as both a sheltered woman seeing the world for the first time, and a formidable warrior kicking German arse all over Northern Europe, Gadot embodies the beloved comic book heroine with an authority not seen since Hugh Jackman became Wolverine in the original X-Men. Chris Pine also does great work as US Air Force pilot Steve Trevor, who is shot down off the coast of Themyscira en route to London, carrying plans for a deadly new German gas weapon. Having brought the destructive World of Men to Diana’s door in fatal fashion, Trevor must not only convince the Amazons that he is not a threat and can be set free, but also that the fate of the entire world is at stake. After meeting her first man and learning of the horrors that exist beyond her idyllic utopia, Diana insists on accompanying Trevor back to “the war”, which she believes is being masterminded by Ares the God of War, operating in the form of General Erich Ludendorff (Danny Huston). Her adventures, travelling in the guise of Diana Prince, see her grow as a soldier, a leader, and also as a woman, inspiring everyone around her to up their game in return. Although a capable military man, Trevor is easily outshone on the battlefield by his new female companion. But rather than be intimidated or dismissive of Diana's abilities, Trevor welcomes his new ally as his equal. Introducing her to everything from dancing and snow to "pleasures of the flesh" and the horrors of “the war to end all wars”, Pine delivers a pitch-perfect performance as both potential love interest and wrong-footed comic relief. 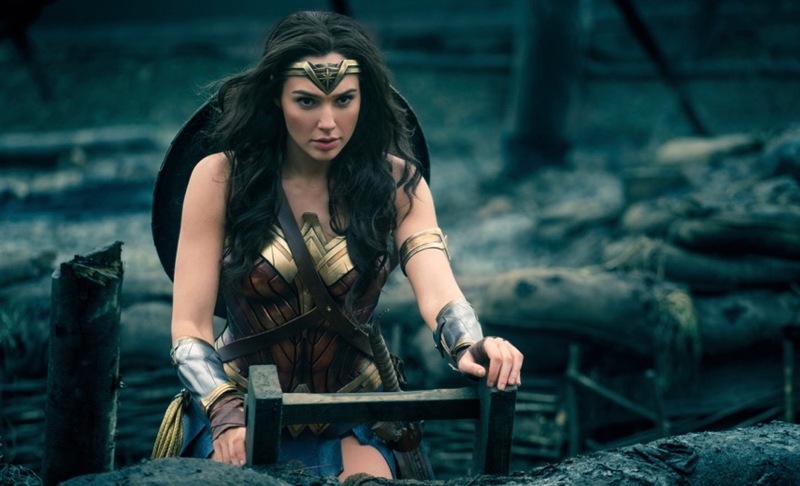 The rest of the cast includes reliable thesps such as Danny Huston, David Thewlis and Ewen Bremner in supporting turns, but it is in the robust female roles where Wonder Woman continues to excel. Connie Nielsen, as Diana’s conflicted mother Hippolyta, Robin Wright as Amazon General Antiope, Lucy Davis’ delightfully frumpy Ms Candy and Elena Anaya’s villainous Doctor Poison all prove memorable additions to the ensemble. What impresses most about Wonder Woman is the film’s confident sense of scale and pace within a vast, multi-tiered universe being presented for the very first time. From the “paradise island” of Themyscira to the blood-soaked trenches of France, Jenkins allows the film to unfold with a grace and clarity not witnessed before now in the narratively muddled and increasingly convoluted DCEU. She handles moments of dramatic realisation and romantic awakening with an equally assured hand, while also ensuring that the film is consistently funny and delivers a cascade of smartly conceived and elegantly executed action sequences. The film isn't perfect, and does falter slightly in the treatment of its villains. Elena Anaya (probably best known as the captive in Pedro Almodovar’s The Skin I Live In) fashions a brilliantly conceived villainess in Doctor Poison, hideously disfigured and reaping her vengeance through her nefarious chemical skills. Unfortunately, just as her character should be stepping out of the shadows and revealing more about her origins and diabolical motives, she is shunted to the sidelines like the Prime Minister of Montenegro. Instead, Ares is unmasked to take centre stage for the the final showdown, only to resemble little more than an ironclad Knight who says Ni. Wonder Woman’s period setting inevitably invites comparison with Captain America: The First Avenger, but holds up to such scrutiny in the best possible way. Just as Joe Johnston’s film proved to be the most ambitious and accomplished offering in the Marvel Cinematic Universe up to that point, so Patty Jenkins’ film easily eclipses Suicide Squad, Batman V Superman and even Man of Steel. Wonder Woman deserves to stand shoulder to shoulder with the very best superhero movies that any studio has delivered to-date, and proves, just as George Miller’s Mad Max: Fury Road did two years ago, that you don’t need a man to make the year’s best action movie. I haven't seen a superhero movie on the big screen for years, but I might have to make an exception for this one. Great review, i'm looking forward to seeing it but was worried it'd be another disappointment from DC. This sets my mind at ease. Me Too. I'm bust my temporary disinterest in the 'people in tights' genre, for the first time in a while. Patty Jenkins’ film easily eclipses Suicide Squad, Batman V Superman and even Man of Steel. Not hard, but accomplished nevertheless. And with ease. Have you seen it yet? Hope you enjoy it as much as I did. Well worth hopping off the wagon for. Saw this one today. Beautiful and Amazing, chiefly for the reasons pointed out in this review. Gadot absolutely owns this character backwards and forwards (it's a very apt comparison with Hugh Jackman's Wolverine). The writing was a little weak in parts, I wished we got a little more depth into not only the villains but also the side characters - but these are minor squabbles. Going to see it again this weekend. Haven't seen this one - - - - yet..
aside for Denis Villeneuve's whack-ah-doo re-imagining(?) of Blade Runner (..along with Atomic Blonde, i must admit.) - this probably is "the" other film this year that I'm Most Stoked to see. I love wonder woman I love Gal Gadot. I have seen the movie several time only becouse wonderful wonder woman Gal Gadot.